John Dvorsky’s fifteen years of experience in geomorphology, hydrology, and fisheries biology has made him an integral part of the Waterways team. John specializes in watershed and stream restoration planning and site-specific project plan implementation. 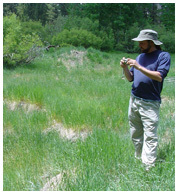 He has managed watershed assessments, salmonid enhancement planning projects, multidisciplinary monitoring programs, sediment source analyses, and reach-scale hydrologic and geomorphic assessments. His educational background, training, and “big-picture” understanding of both the biological and physical components of a project, allow him to synthesize the available information and make quality resource management decisions. John works closely with Waterways engineers to make sure current geomorphic, hydrologic, and ecological principles are being integrated into restoration projects. M.S. University of California at Santa Barbara; June 2000. Geography Department – Geomorphology/Hydrology/Fisheries Ecology/GIS. B.S. University of California at Santa Barbara; June 1993. Aquatic Ecology and Environmental Science.